Boxes of signed petitions were delivered to the Albuquerque City Clerk in early August. The Bernalillo County Commission voted last night not to put a public financing proposal on the November ballot. The vote was 3-2 with Democrat Steven Quezada and Republicans Lonnie Talbert and Jim Smith voting against the measure. Almost 28,000 Albuquerque voters signed petitions to put the measure on the ballot, to fix a city public financing statute that was hobbled by a U.S. Supreme Court decision back in 2011. Talbert was more blunt, according to the NM Political Report. “I don’t like that the city council doesn’t put it on their own frickin’ ballot,” he said. The Bernalillo County Commission controls whether special city proposals can go on the ballot for city voters in elections, like the upcoming one, that aren’t run by the city. All Albuquerque voters live within Bernalillo County. 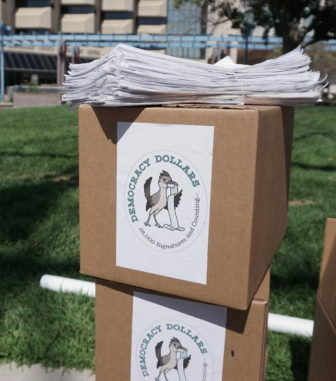 Leaders of the Albuquerque “Democracy Dollars” public financing ballot initiative want the Bernalillo County commissioners to call a special meeting next Tuesday to vote again on placing the charter amendment proposal on the November ballot. This time with a public comment period on that issue alone.